Sometimes a deal between rivals can be a win-win. SunPower Corporation (NASDAQ:SPWR) and Enphase Energy Inc (NASDAQ:ENPH) are continuing to transform their businesses after a rough couple of years, and a new deal will have the two solar companies working together. SunPower is selling its solar microinverter business, acquired from SolarBridge in 2014, to Enphase Energy, which will begin making custom microinverters for SunPower's high-efficiency solar panels. In a lot of ways, the deal makes sense for both companies, giving SunPower another infusion of cash and Enphase Energy a big customer with consistent microinverter demand. This could be a deal that's a win-win for both companies' long-term prospects in solar. Home with SunPower solar panels on the roof. Image source: SunPower. Enphase Energy will pay $25 million in cash and issue 7.5 million shares of stock for SunPower's microinverter business. One of the more intriguing details is that Enphase looks like it'll shut down SunPower's microinverter business immediately. The press release announcing the deal highlighted that Enphase's IQ microinverters will be used for SunPower's solar panels, not the microinverters being acquired. In essence, Enphase is buying a customer in this deal. Enphase did say that it expects to add $60 million to $70 million of annualized revenue in the second half of fiscal 2019, with a gross margin of 33% to 35%, as a result of the acquisition and supply agreement with SunPower. That's really what it's getting for $25 million and 7.5 million shares of stock. The reason SunPower is selling its microinverter business is easy to see. It gets $25 million in cash, along with potential upside from Enphase Energy stock, and will likely be buying a better microinverter than it was making itself. Enphase's iQ7 microinverter has an efficiency rating of 97.5%, compared to 96% for SunPower's microinverter, so this is an upgrade from a performance standpoint. Getting out of the microinverter business will also allow the company to focus R&D spending on its core competency: making solar panels. Microinverters may have become a distraction that wasn't worth the cost for SunPower. I mentioned the $60 million to $70 million revenue impact this deal will bring to Enphase, and you can see below that the company's revenue could jump 20% as a result. 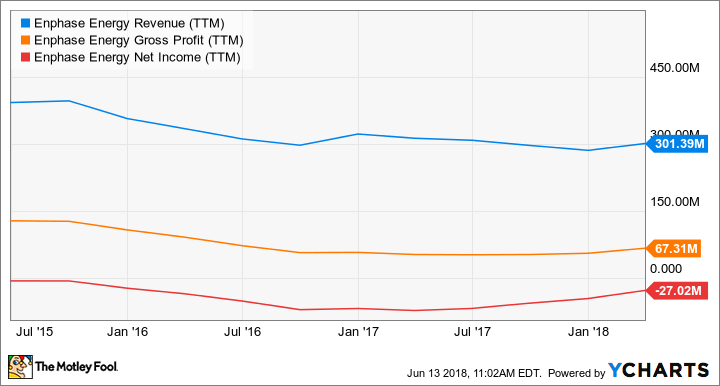 If gross margins are as strong as predicted, buying SunPower's microinverter business could even put the company on the brink of profitability in late 2018. Having SunPower as a customer will also bring a large and stable buyer for IQ products as they try to gain market share. That should help lower costs by leveraging economies of scale, and may convince other buyers that if it's good enough for SunPower, it's good enough for them. Enphase Energy needed a way to grow revenue and return to profitability, and this looks like as good an option as any. The biggest potential upside to this deal benefits Enphase Energy, which has yet to prove that it can return to sustainable profitability. Having SunPower as a customer will help on that quest, and shares are surging 35% higher on renewed investor confidence in the company's turnaround efforts. It also shouldn't be forgotten that selling its microinverter business is part of a bigger strategy by SunPower to focus its solar business on what it does best. Now that it'll be focused on making solar panels better and providing complete solar solutions to residential and commercial customers, it doesn't have to be an expert in microinverters too. And $25 million in cash and around $45 billion in Enphase Energy stock is a nice payoff for giving up a business SunPower probably didn't have a durable advantage in the first place. Sometimes deals between potential competitors can be win-win. This appears to be one of those cases.